When the temperature rises and water is being restricted in Salt Lake City it is not uncommon to see a lot of dry lawns out there. Here are a few common factors in the Salt Lake City area that can affect your lawns ability to absorb moisture. Cause: It is not uncommon to have a shade grass (typically a Fine Fescue) in an area that is in direct sunlight. If the blades are thin and tube like, it is most likely some variety of shade grass. This happens, because shade grass out competes the other grasses in the early spring and in the fall if your lawn is not regularly fertilized and is thin. Solution: Split your watering cycle to water more frequently for less time and overseed with a more sun tolerant grass type in the spring and fall after an aeration or power raking. Cause: Soil type can cause the water to either pass through too quickly or not at all. It is easy to identify your soil type, here is a video. Solution: Use the soil amendment humate to improve soil structure. Also an aeration will help to mechanically give soil better structure.If your soil is high in clay use gypsum to improve the structure and help penetration. If the soil is sandy split up water cycles to water more frequently for less time. Cause: Bad watering habits. You should never be watering every day, this can cause your roots to be shallow. It will look great in the spring, but once the temperature rises your lawn will struggle with such a shallow root system. This not only makes for a unhealthy drought stressed lawn, it will also be expensive to maintain. You can find yourself constantly turning up the watering to keep the lawn green. Also shallow roots invite pests and disease. Solution: Learn from your mistakes and change your watering practices next spring. 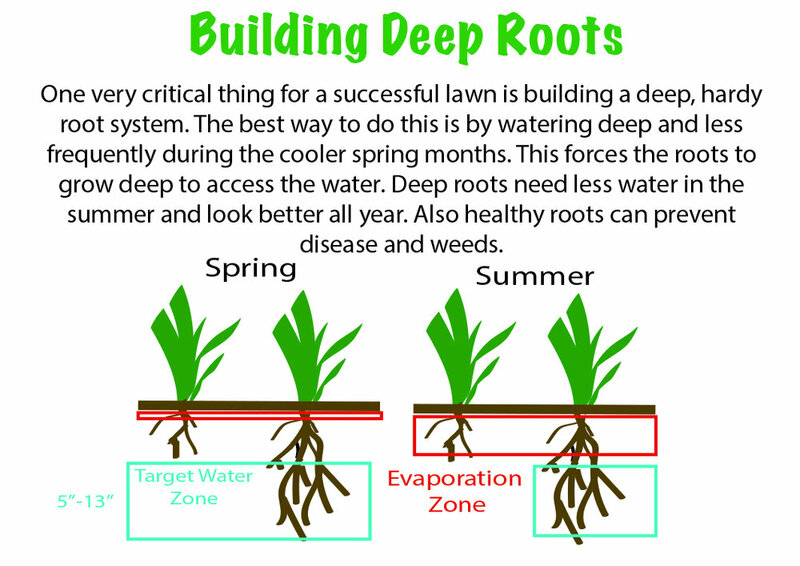 Deep soaks less frequently are ideal to help develop a deep and robust root system for your lawn. Cause: Your lawn might not be dry, but may have grubs. Grubs are most common in the heat of summer. Grub damage looks very similar to a dry lawn, but if left untreated it can spread quickly and be unrecoverable. If you are putting down more and more water and it isn't helping, you most likely have grubs. Investigate the area even if you think it's just dry. Give the lawn a good tug, if it peels up like carpet then you have grubs. The sooner you identify grubs the better! You can save yourself a lot of work by catching them early. Solution: You can call us or you can treat them yourself. There are many over the counter products for grubs, but it is always a good option to hire a professional. Cause: Just not watering enough, not at the right time, or your sprinklers need to be adjusted. Solution: Watering should always be done in the early morning hours and your sprinklers should be overlapping for nice even coverage. For weekly watering amounts there are usually many local resources available. Typically 1-2 inches a week is standard. I hope this has given you some insight into how to best care for your lawn. If you need a landscaping professional to help you achieve a great lawn or help with other projects just get a quick and easy estimate from us. We truly care about our customers having the best lawns and a superlative customer experience! Get an online Estimate! Top 3 reasons your lawn is mostly weeds!